Address: 260 kilometres off the west shore of Broome, Australia. Coral reefs are a synonym of Australia. Situated 260 kilometres west of Broome, Rowley Shoals is located on the edge of the widest continental shelf in the world. The Rowley Shoals are a group of three coral reefs- Mermaid reef, Clerke Reef, Imperieuse Reef. Needless to say the coral reefs are major attraction if you love to dive to the serene depths to see the corals in their true beauty. Swim among humpback whales, manta rays and hammerhead sharks. For travellers who are reminded of the movie Jaw every time they are at sea- the beautiful landscape is just as much of an experience. The only way to dive at the shoals is through Liveaboard Dive Boat. Visit the official website for the Liveaboard Dive Board for diving prices and bookings. Best time to visit the shoals is from October to December and the only way to dive these atolls is by Liveaboard dive boat. 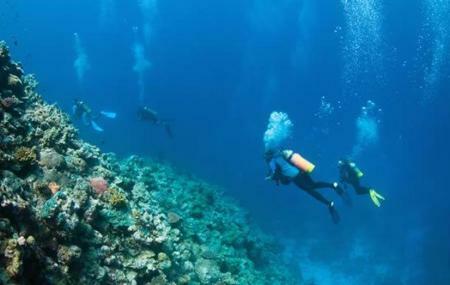 Rowley Shoals Address: 260 kilometres off the west shore of Broome, Australia. How popular is Rowley Shoals? People normally club together Reddell Beach and Malcolm Douglas Wilderness Wildlife Park while planning their visit to Rowley Shoals. People also prefer to start their day with Rowley Shoals.